Science and Technology Facilities Council: Gravitational Waves – Competition, Talks & Resources! The Science and Technology Facilities Council (STFC) has three fantastic offerings to engage you and your children about gravitational waves! Ideally Videos should be uploaded to YouTube and links emailed in to Phill Day. The email should include the name of the school, contact details and the name of your local STFC Lab site (either the Rutherford Appleton Laboratory near Oxford, Daresbury Laboratory near Warrington, or the UK ATC in Edinburgh). The videos produced will be shared on the Science and Technology Facilities Council Twitter Feed (@STFC_Matters) as well as on the Facebook Page. Videos will also be collated into a montage of videos that will be shown simultaneously at the end of each of the Educational Talks taking place in December. Each STFC Lab site will select the 3 videos that it deems most creative to receive a copy of ‘Cosmos: The Infographic Book of Space’ by Stuart Lowe and Chris North. The demonstrations in your video can be as simple (or as complicated) as you like. As momentum increases towards the Nobel Ceremony in December, STFC are also offering you an opportunity to register to bring your pupils to talks about gravitational waves provided by fantastic speakers and researchers at the forefront of gravitational wave research here in the UK. These talks will take place on Monday 4th December at Daresbury Laboratory near Warrington (please email Phill Day to book – please note that places are limited!). If you are unable to make it to the venues for the talks then the Daresbury talks will be live streamed. Between 2:30pm and 3:00pm the Daresbury speaker Chris North will also be fielding questions both from the lecture theatre and from online viewers. To enable pupils to ride the wave that has been generated, the UK’s Science and Technology Facilities Council (STFC) have put together an electronic resource pack for teachers to access in the classroom with their pupils to help them to understand what gravitational waves are and how LIGO is able to detect them. The resources have been written by a variety of authors both in the UK and beyond and includes digital broadsheets, videos, demonstrations and classroom activities. 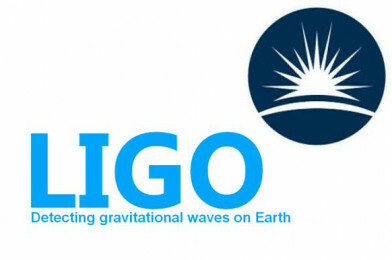 Page 2 and Page 3 provide some diagrams and background information about how LIGO works (these diagrams can also be displayed on a whiteboard using the gravitational waves broadsheet in the Prezi – see below). Pages 4, 5 and 6 require the pupils to complete some data interpretation to reinforce some of the science involved in the LIGO detections and also point children in the direction of some real gravitational wave data that they can work with linked to ‘Gravity Spy’ a current citizen science project about gravitational waves on Zooniverse.